My humanity clung to me like Saran Wrap, safeguarding my dignity somehow I find this is comforting. I am still the same person I was before. And As I struggle to understand my feelings of disempowerment and to help me feel more empowered I decided to write this blog post. To tell you the truth, it is complicated. The purpose of this post is to understand my feelings during the few weeks that I stayed in a rehabilitation institute following a stroke, in an attempt to understand the feelings I was experiencing while there. Because I had a lot of free time to think about – and to try to understand – what I was going through, it got me to thinking about my late brother Samuel. A few years ago he had spent a number of months in a similar situation after suffering a brain injury. “Of course” I responded. I told him that the rules were there to help and protect him. Had I known then what I know now I would have been more understanding. I know now that what he was feeling was a sense of disempowerment and oppression. I would have been able to validate his feelings at the time, but I hadn’t gone through this experience yet, and I couldn’t fully relate to what he was feeling. This is very much the way I felt at the rehabilitation centre. Inferior. The main feeling I had is having no control over my circumstances, feelings of being “less than.” It was as if I didn't matter, that my opinion didn't matter, that even though my program was being tailored to meet my needs, my input was never requested and apparently considered irrelevant to my recovery. Once a week the team of doctors, nurses, physiotherapists and occupational therapists would meet and discuss the patient's progress and alter the program as required. I was never in those discussions. It seemed to me that they talked amongst themselves about me as a case, not a person. In my life I have usually had a great deal of control over myself and my circumstances. If I found that I didn't have control I always adapted and created some measure of control for myself. I have always adapted to new challenging circumstances, and tried to use them to my advantage. I don’t mean that I surrender or just accept the new reality. I mean that I try to improve and to make it better for myself. In doing that, I actually end up having more control over my life. Here is the important point. Even when you have no control over a new situation you always, always have control over your own reaction to it. One of the ways I adapt to a new situation is by writing about it. Writing often helps me process the situation and understand it. It can open me up to the possibility of seeing things from a different perspective and it provides a space where I can be inventive in assessing possible reactions. Of course my situation at the rehabilitation center was different than my brother’s. I am recovering from a stroke, which has added another complicating layer to the mix. My brother, however lived a different kind of life where he seldom, if ever, had much control over himself or the circumstances of his life. I feel some guilt that I didn't understand his predicament back then. I really wish I had understood, like I now understand, what he was feeling. In hindsight it is easier to see. Although he had been working on his emotional issues stemming from abuse in residential school, he was still deeply disturbed by his experience. He always carried the damage within him and didn't know how to deal with it. He was very unhappy. Although if you saw him you would think that he was a pretty happy guy. To the world he masked his pain with laughter, but it was always there. That is important to acknowledge because as I try to make sense of what I am feeling and I begin to understand where these feelings are coming from, I have no doubt in my mind that what I was feeling stemmed from my own experience in residential school. My brother and I had that in common, as did most of my large family. Being in a rehabilitation center reminded me of my childhood in an Indian residential school. In both institutions, a group of people make decisions for a smaller group for their benefit. It did not take me long to become aware that the negative emotions I was feeling in rehabilitation stemmed from my residential school experience, and this realization helped me understand and reconcile my feelings. I was constantly being evaluated and accessed by a multidisciplinary team of doctors, occupational therapists, and physiotherapist, while I was healing. Of course they were all attempting to help me recover from a very serious Incident, and everything they were doing was for my benefit. Just as the nuns, priests and teachers took away our freedom and a bit of our humanity, like our language, culture, and who we were, while they were to giving us an education and hoping to indoctrinate religion into our souls. however, at this point I would like to add the difference here, is I was no longer a child removed from her home and culture, I am a grown woman, a university educated woman, and I will emphasize able to to understand complex realities. It would have been valuable to be able to communicate these feelings to someone who had an understanding of residential schools. But having input into my own recovery seemed to be an afterthought in the institutional culture. In these early days of reconciliation it is advantageous to understand the way we residential school survivors have experienced the world. In fact the Truth and Reconciliation Commission in their final report went further and described the Indian residential school era as cultural genocide, a label that upset a lot of people. However, there really is no other way to describe what happened to us. It is no wonder the majority of us have an inferiority complex. To understand where I'm coming from I needed to accept that my residential school experience had deeply impacted my worldview. Residential schools were designed by the colonizers who had an agenda to erase the Indian from the Indian child, and it played a major role in forming who I am today. And like it or not I have been influenced by those childhood experiences. 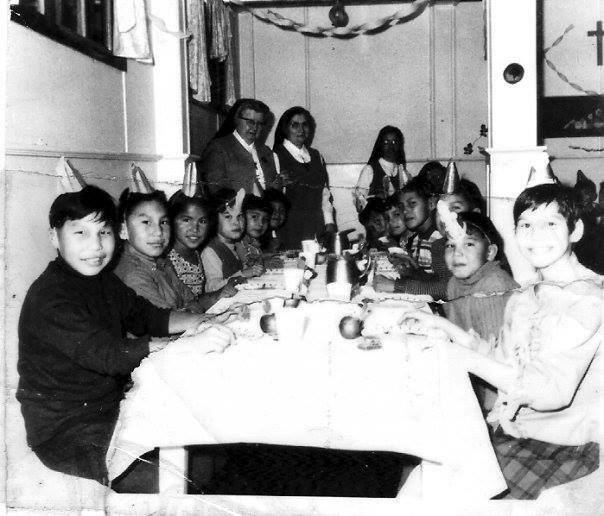 I have written elsewhere that my residential school experience at Holy Angels did not include the kinds of abuses that others experienced – even my own family members in the same school at the same time. But the psychological legacy of that experience is still profound. Sometimes I find I am oversensitive and I would have a knee jerk reaction to uncomfortable situations because I misinterpret something that has happened. It is difficult to explain why I react as I do to certain situation unless you have had this shared experience, you will not fully understand what I am trying to say here however, it didn't just give me an inferiority complex. It also gave me something of a rebellious attitude, a resistance to authority, to the kinds of arbitrary rules our days were filled with. But it also gave me a curious approach to life. Holy Angels had a library where I'd love to sit and read. I began reading as many of the books on the shelf as I could when I had free time. It is where I developed my love for reading, serving as an escape and helping me understand there was a bigger world than just my small residential school. I developed a curiosity, always looking to understand the first principles of a situation; why a certain thing is the way it is. Why people behave as they do. I learned to look under the surface, to look deeper. For example, some survivors automatically dislike authority, like myself, and being told what to do, because of all the rules we had to obey, rules that were never explained. But I didn't just accept the rules. I always wanted to know why they were established and what their point was. It did not satisfy me that the answer was for my own good. I also didn’t like being observed, because we were continually under observation by the nuns. Perhaps this is the reason I resented the multidisciplinary team who were tasked with observing me. Being in residential school we were not exposed to healthy relationships. The only relationship we witnessed were between the nuns and the students, and they were not always positive role models because the relationship was on an unequal footing. The nuns were in an authoritative role and always in a dominant position. And of course they had no experience of healthy family life themselves. It gave rise to a feeling of inferiority that is deeply rooted within us residential school survivors, like we don't measure up to the rest of society, that we were inferior and that special schools had to be created because of that inherent inferiority. The damage of trying to assimilate us is embedded deeply within our psyche. Over the years since leaving residential school I have worked diligently in understanding my childhood experiences and have been working on developing a healthier attitude in my interaction within society. In fact, in my own personal relationships, rather than working on a difficultly in the relationship I would more often than not feel that walking away was easier rather than looking at how I was reacting within the relationship, trying to understand that and working through the difficulty. I still witness this type of reaction from many residential school survivors. They would prefer to just walk away give up rather than to try to explore why they are feeling and reacting to certain situations. For example In one of my relationships, after a dinner, which included a number of lawyers from the University of Western Australia, I got upset because I felt they were being racist towards me. But the truth is they were just being insensitive Australian males, who on the whole are of the mind that women have an inferior place in a relationship. It had nothing to do with me being Indigenous but more to do with me being a woman. I really don't know which of the two position is worse. At the time I took it personally, and my first response was to leave. That is my default reaction to difficulties. When we went home I decided that I was going to pack a bag and leave. I booked a flight to Indonesia for a few weeks, while I pondered whether or not I wanted to get married and stay in Australia. At the end of the day, I decided not to marry him and I returned to Canada. Since then I have done considerable work on myself on understanding why I react in a certain way to different circumstances and I have learned not to walk away at the first sign of difficulty. I applied that understanding to my feelings at the rehabilitation center. I have come to the conclusion that my feelings of lack of empowerment, or perceived lack of empowerment, was at the heart of it. The trauma I experienced in residential school sometimes will still cloud my perception of an experience. I understand that now. Early in my relationship with my husband he commented that I am an enigma. He has explained that he simply meant that I was complex and that there were depths to my personality beneath the surface. At the time his description didn’t really seem accurate to me. I have always liked to think of myself as uncomplicated and simple, and drama-free. But given my history, complicated is probably more apt description of me. I can’t emphasize enough the value of empowerment in healing. On the first day I transferred to this hospital, I met a doctor who I immediately connected with, AKA Dr.Finest-one I felt that he was interested in me as a person and not just a patient. It was evident in his mannerisms and the way he spoke to me. More importantly he explained my medical condition in non-technical terms that made it easier for me to comprehend, it is also important to note that he assured me that what I was experiencing was not isolated to just me, but is something experienced by most stroke victims. This was reassuring because I felt my recovery was not something that I alone am experiencing. And it helped set the tone for the rest of my stay, although that doctor was not part of the team that looked after my case. When you connect with another person on a human level it is transformational. It creates a bond on a human level. You feel cared for. For example, you actually listen better to one another, which results in more empathy and compassion for the other person. This is an important factor when looking at rehabilitation because you have to be cognizant of a patient’s history because it will play a significant role in how the patient deals with their difficulty. And how quickly they recover. I can see the value of a multidisciplinary approach in rehabilitation. However, I think that an important element was overlooked, which is communication with the patient. For me, this is important. I am the type of person who is curious about why certain things are done. And my personality it is one of inquisitiveness, where I really do like to know and understand what is happening. To be sure, I like to understand fully the methods and the thought process behind implementing the big plan. specific protocols. For example, in rehabilitation there is a lot of repetition of simple tasks, and at the time I thought the need for constant repetition was a signal that I just was not getting it, and that I was a poor learner. Having been home now for a couple of weeks, I understand the need for repetition because that is how the brain is trained to work around the damage caused by the stroke. Realizing this has served me well now that I am home. Indeed, I appreciate that deferring to the experts in the field is required because their expertise will ensure that healing and recovery is done in the most efficient and complete manner. Still, it would have been beneficial to have the rationale for these repetitious exercises explained to me, the patient. Instead of eagerly engaging in the simple therapies that I needed for recovery, the lack of explanation left me feeling less empowered than I already was. Each session seemed like a test that I was failing. When you have suffered a dramatic event like a stroke your whole life can seem uncertain. You need to have your own human dignity recognized and affirmed more than ever. Instead, you have professionals watching you go through various tests, nodding and making notes. Essentially you are a passive observer in your own treatment. They share their notes and discuss their conclusions with each other. But the patient, whose wellbeing is so uncertain and whose sense of self is so impaired, is not included. Of course, there can be no consent if information is not fully disclosed to the patient. Having the input and consent of the patient is also important. Communication within a team of professionals Is vital but so is how this information is communicated to the patient and then relayed back to the team. Communication has to be done in a way that doesn’t undermine the self-confidence of the patient and they are being dealt with as intelligent adults who are entitled to know and understand the details of their program in a clear respectful way, which brings me to another component, the issue of informed consent. How would you otherwise know when the patient understands and gives their true consent to treatment? The evaluation of the patient should include looking at them completely as an whole person. Which means knowing and understanding their complete history. True empowerment begins with consent. And consent is only meaningful if it is fully informed. In this climate of reconciliation I feel that any protocols for rehabilitation of First Nation patients must include a consideration of the emotional trauma of residential school survivors. While my residential school experience was not entirely negative, and I was neither sexually or emotionally abused, I spent my formative years in an institution that was built upon unhealthy power disparity and whose whole rationale was to forcibly change me whether I wanted to change or not. Similarity, other patients from other backgrounds may also being these kinds of difficulties into a rehabilitation setting too. Many of my fellow stroke survivors in the rehabilitation institution were immigrants, with little grasp of English and a clear sense of bewilderment. Others were elderly people, clearly in distress at their new state of helplessness and apparently surrendering to their fate. Being aware of the psychological dimensions of their patients would greatly help professionals understand the psychological and emotional state of the person they are dealing with. It is all about the human dignity of the patient. We are human beings. The underlying fundamental intent ought to be to preserve and protect our human dignity. We are damaged, and we need more than ever to feel that we are still worthy. We need to rebuild our self-esteem and to have agency in our recovery. Our professional caregivers need to know that, and to help us, not to reinforce unconsciously our feeling of being less than fully human. In conclusion, I have never been one to see myself as a victim. In fact, I most often will view things from the perspective of how it will empower me. And this experience is no different. Which brings me to the subject of reconciliation. Reconciliation: what does that mean in the treatment of First Nations peoples? The TRC Commissioners hope that it means Canadians will take their findings seriously and use it to help them establish a healthier respectful relationship with first Nations, that recognize and understand the history of residential schools in Canada, this is my hope too. What Have we Learned: Principles of The Truth and Reconciliation Commission of Canada Final Report (2010) page 113.
you don' know what you'll miss until you can't have it. Is Conventional Wisdom Diminishing Your Ability To Successfully Lead Others? The day I turned 28 ;) (Yes I dare to say the number)...Am I really this old? 9 keys to achieving your artistic goals? No! Way more! You asked for it! We listened. Paycheck????? what is your worth? ?